Squeezed between Tuscany, Le Marche and Lazio, Italy’s only landlocked region is also known as the green heart of the country. Umbria’s bucolic landscape is one of olive groves, vineyards and golden hillsides punctuated by cypress trees but also home to wooded gorges, lakes and waterfalls. Along the east side of the region, the dramatic Monti Sibillini separate the region from Le Marche. Nestled amongst this glorious rolling countryside, timeless towns and villages house magnificent art works which reveal much of the region’s history. Once dominated by two tribes, the Umbri and the Etruscans, the region subsequently fell to rule by the Romans who were responsible for the construction of several public works which can still be seen today. The 13th century saw the birth of Umbria’s most famous son, St. Francis of Assisi, the patron saint of Italy. In May and June, fields and meadows are scattered with wild cyclamen, iris, poppies and other spring flowers. Follow historic routes and pilgrim trails, once walked by St Francis, past abbeys and Benedictine monasteries. 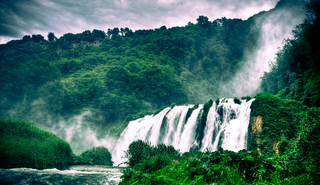 Natural highpoints include the Apennine mountains and the Monte Cucco National Park, but the region also features central Italy’s largest lake, Lake Trasimeno, and waterfalls at Cascate delle Marmore near Terni. Gorge on art works that include paintings by the masters. 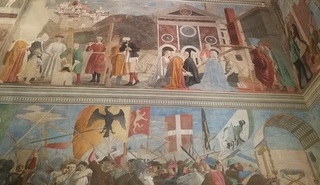 See paintings by Piero della Francesca and Giotto frescoes in the Basilica di San Francesco in Assisi. Other painters who worked in Assisi in the 1200’s and 1300’s include Cimabue and Giotto while in Spello, Pinturicchio decorated the Cappella Baglioni in the church of Santa Maria Maggiore. Wine trails, visits to oil presses and a wonderfully rich culinary tradition all make Umbria a favourite spot for food lovers. This is a meaty region, with recipes featuring game and big flavours. In the south of the region, Norcia is known for its lentils, saffron and its distinctly-flavoured, aged prosciutto, deriving from pigs fed on acorns and chestnuts. 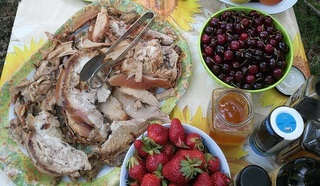 Elsewhere, hearty favourites include ‘porchetta’, pork roast stuffed with herbs, carved and crammed into thick rolls. The region is also renowned for its sheep’s milk cheese, variety of beans and pulses and lentils from Castelluccio. Wild growing asparagus, fennel and porcini mushrooms are also prominent. 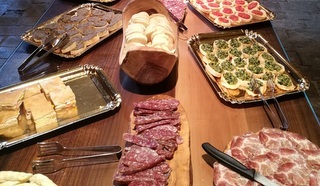 Mention must also be made of Umbrian olive oil which has the prestigious DOP quality denomination label. Truffles are an integral part of Umbrian cuisine. 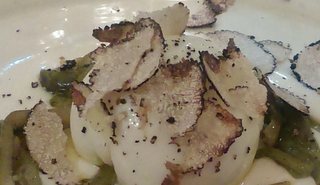 Black summer truffles make their appearance from May to August, growing wild in the Apennine forests, while the prized white truffles are generally harvested between October and December. Alongside Turin (Piedmont) and Modica (Sicily), Perugia is one of Italy’s leading chocolate cities. The famous Perugina chocolate factory, the Casa del Cioccolato, was founded in 1907, finding international fame with the production of Baci chocolates. In October, Eurochocolate celebrates all things chocolate with chocolate art and chocolate-making demos. 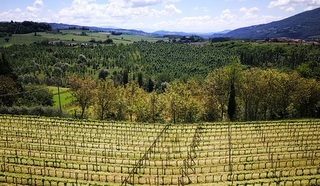 Umbria’s wine-making tradition began with the Etruscans over 2000 years ago. Today, the deep opaque-coloured Montefalco Sagrantino DOCG and Montefalco Rosso DOC, the latter made from the Sagrantino grape blended with Sangiovese, are amongst the best known. Colli Martani DOC is produced close by. Equally well-known, Orvieto DOC is a crisp white made with Trebbiano, Grechetto, Verdello and Canaiolo grapes from the hills around Orvieto. 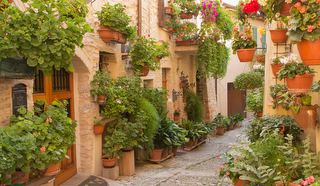 Much of Umbria’s charm lies in the many picturesque medieval towns and villages. The main towns will easily keep you occupied for a full day but the smaller, second tier towns of Montefalco, Spello, Bevagna and Montone are also well worth a visit. Perugia is the regional capital, home to a 14th century University that is one of the oldest in Italy. Head straight for the historic centre to explore Etruscan, Roman and medieval monuments and one of the country’s finest Gothic palaces (the Palazzo dei Priori). In Assisi, life revolves round St Francis. The UNESCO World Heritage Site of the Basilica of San Francesco d’Assisi, built between 1228 and 1253, is crammed with unmissable frescoes. Situated in northwest Umbria, Gubbio is one of the region’s oldest and most delightful villages. Highlights include the steep, winding streets, the ruins of a Roman theatre, the Duomo and the 14th century Palazzo dei Consoli. 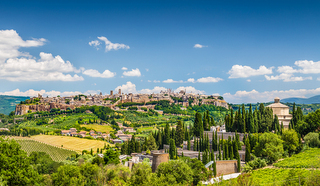 Inhabited since the Etruscan era, Orvieto is one of Umbria’s busier towns although still worth visiting if you have the time. Take a walking trail around Orvieto’s cliffs, visit the underground city of 1200 stairs, wells, tunnels and rooms and see the Last Judgment frescoes in the cathedral’s Cappella di San Brizio. Situated in the south of the region, Spoleto and Todi are both charming towns, visually stunning and historically interesting. In Spoleto, where Roman arches and an amphitheatre sit alongside a 12th-13th century Duomo, the town is dominated by an imposing medieval fortress castle built by Pope Innocent VI. The hilltop town of Todi boasts a glorious early medieval piazza, lined by cafes and palazzi and overlooked by the Duomo. Wander through the town’s streets and pop into some of the smaller churches on the way. Umbria features some of Italy’s liveliest festivals, with local saints, food and music taking centre stage. 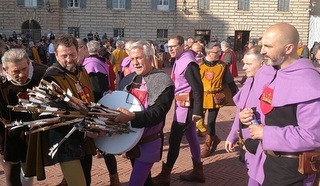 These are just a few of the main events: The Palio Balestra in Gubbio is a spectacular traditional crossbow event, held on the last Sunday of May in Gubbio’s main piazza. The Corsa dei Ceri (15 May) involves the ‘ceraioli’ (candle-holders) parading through the streets and racing to the top of Mount Ingino bearing the huge ‘Ceri’. In Spello, the streets of the town are carpeted with flower petals, arranged into mosaic-style pictures, during the Infiorata festival. Spoleto takes on a party atmosphere from the end of June to mid-July when the internationally-renowned festival hosts art, theatre, ballet, opera and music events around the old city centre. Visit Perugia in July for the Umbria Jazz Festival or in October when Eurochocolate takes place. Porchettiamo in Bevagna is a traditional Italian food festival that takes place in mid-May, celebrating one of the queen of street foods, the humble roast pork sandwich. Our Medieval Umbria tour focusses on northern Umbria, travelling from Arezzo in Tuscany, over the Apennine mountains, along pilgrim trails and into the heart of Umbria. If you wish to take a tour in a neighbouring region, and extend your holiday with a stay in Umbria, we recommend our Lucca, Volterra and the island of Elba tour. The closest international airports to Umbria are at Bologna, Pisa and Rome. Smaller airports include Perugia’s San Francesco d’Assisi and Florence’s Amerigo Vespucci, or Peretola. 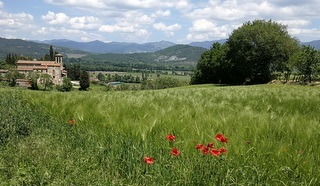 For more information about Umbria, visit the Umbrian Tourism website.